Twenty-five years have passed since I invented Pair Go and the first tournament, the 1st International Amateur Pair Go Tournament NKB Cup, was held. Thinking about how one could popularize the game I love, Go, more widely was what led me to conceive the idea of Pair Go. Go has been an important pastime for me ever since I learnt it as an elementary-school pupil until the present. Some 30 years ago, I had an opportunity to help out at the Nihon Ki-in, and at that time, as someone who loved the game, I became convinced that for the sake of the development of Go we had to broaden the base of Go fans. As symbolized in the Castle Games played at the Shogun's palace in the Edo period, Go has flourished in Japan since ancient times. Some 40 years ago, Go was very popular; when it enjoyed its peak of popularity, about 6% of company presidents in Japan were said to play Go as a hobby. After that, however, the Go population gradually decreased. For a zealous Go fan like myself, it was hard to just stand by and watch this. I felt that we had to stop the decline in the number of Go fans and aim at popularizing the game widely again. At this time, I took part in a social gathering of Go players. Before my eyes, there were a number of young women who had laid out two Go boards and were delightedly taking turns to play a game of team Go. I became convinced that we should make use of this atmosphere of women having fun as energy for popularizing Go. Team Go is enjoyable as an exhibition game. However, when viewed as a competitive game, it has a drawback, I think. When the person next to you has played a move, you have to play it as well on the board in front of you. In short, during the game you use the left side of the brain, so the competitive meaning of the game is reduced. I wondered if one couldn't eliminate this operation using the left brain . . . After thinking about it, the idea I came up with was Pair Go, with two people playing against two people on one Go board. This way, you could play a game using just the right brain, which can be called the competitive brain. Moreover, with pairs, a total of four people play, so the variations in the fighting would increase and you would have to read the partner's strategy as well, adding to the interest of the game. Intuitively, I felt that this could become a completely new game, and at the same time my concept rapidly developed. After systematizing the concept of Pair Go in my head, I naturally thought about the concrete rules. I decided that in principle a team would be made up of a male and a female. In a pair, even a female who was a beginner could lightheartedly become familiar with the game, and I would achieve my original objective of broadening the base of Go fans by getting more women to participate. This kind of image welled up strongly. I decided that the order of play would be the female with black, the female with white, the male with black, and the male with white; the game would follow this rotation order. Since four people are playing the game, the risk of rotation mistakes can be hypothesized. An intentional rotation mistake would be an infraction of the rules, but I decided that if it was not intentional, there would be a penalty of three points. I decided that conversation between the partners during a game was forbidden. During a game, you can't consult your partner about where to play next, so you have to read out the aims not only of the moves played by the opponents but also of the moves played by your partner. I thought that this would make the course of the game much more thrilling and increase the profundity of the game. After organizing the rules like this, I held the 1st International Amateur Pair Go Tournament NKB Cup in 1990, with 32 pairs and 64 players from four countries and territories taking part. However, the main aim of this first tournament was to verify the concept that I had worked out; I thought of it as a preliminary tournament, so the company of which I was then the president, the NKB Inc., became the sponsor. Actually, in this tournament, we had the pairs play using two Go boards as in team Go. This was in order to verify my hypothesis that laying out the moves in the same way as team Go would damage the game aspect by affecting the left brain. We questioned the players after their games and furthermore consulted experts, and the result was as I had expected. I reached the conclusion that playing on just one Go board would improve the game aspect by making the right brain the core. We had thought of the first tournament as just a preliminary, but the tournament itself was a great success. Thanks to this success, I became confident that we had perfected this new game as a game, and I resolved to promote it under the name of Pair Go, to develop it properly and popularize it widely around the world. For the venue of this tournament, we used a high-class hotel. We also took care about the layout of the hall, so that women would enjoy participating. We also made it nonsmoking at the hotel and requested the participants to dress up more than usually. That was because I wanted to promote Pair Go as a social occasion for men and women. Out of a desire to make this even more explicit, we later instituted Best Dresser Prizes at the International Amateur Pair Go Championship. At the 1st International Amateur Pair Go Tournament, we were able to confirm the high value of Pair Go as a game and felt reassured that we would be able to popularize it. At this stage, I requested the support of Masatake Matsuda, who was then the Vice President and later the President and then the Chairman of East Japan Railway Company. Mr. Matsuda, who likes Go and understands about popularizing it, is like my older brother; he sympathized with the aims of Pair Go and readily offered full-scale support. For the second tournament in 1991, we were able to obtain sponsorship from East Japan Railway Company and others who appreciated the significance of the tournament, and it set out on its path as a more serious international tournament. We were very happy to get the support of railway companies, beginning with East Japan Railway Company. 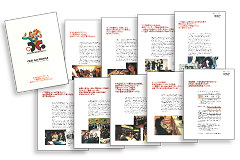 When the time of the tournament drew near, posters would be displayed on stations and in train carriages. Many people going to work or school or using the station for shopping saw these advertisements and PR, and there is no doubt that this was a big factor in the development of Pair Go. Incidentally, the support of East Japan Railway Company is still continuing as of the 25th tournament, and it has been a great help in the propagation activities of the Japan Pair Go Association. Pair Go made a favourable start, and as awareness spread that it was proving useful in popularizing Go, the next task I grappled with was establishing a juridical foundation as the cornerstone for the steady development of Pair Go. Initially, there were voices around me suggesting that it would be difficult to get a Pair Go association recognized as a juridical foundation. However, the differences between Pair Go and ordinary Go as a game were clear, and Pair Go had a future thanks to its unique interest. And it was also effective in popularizing Go and useful for protecting and nourishing Japan's Go culture. For those reasons, I was firmly convinced that we could secure recognition as a juridical foundation. 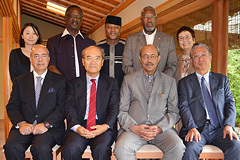 Among these persons who became enthusiastic backers were Ichiro Yoshikuni, who was well known as the director of the Cabinet Legislation Bureau, and Koichiro Matsuura, who later became the 8th Director General of UNESCO. When we founded the Japan Pair Go Association, Mr. Yoshikuni became the first president. When we established the World Pair Go Association in 2008, Mr. Matsuura became the first president. I also remember that I was greatly encouraged to receive the support of Fumio Watanabe, who was well known as the president and later the chairman of Tokio Marine and Fire Insurance Company and who at the time was Chairman of the Board of Directors of the Nihon Ki-in. Mr. Watanabe had devoted ten years to founding the Public Interest Incorporated Foundation the Japan Contract Bridge Federation. When I met him and explained our aims, he immediately showed his understanding, saying: 'Mr. Taki, this is interesting.' In the Go world, Kaoru Iwamoto and Tatsuko Masubuchi also showed interest. Others to express support included Masami Kogayu, Deputy Office Director of the Ministry of Finance, Eitaro Iwama and Masaaki Kokubun, Deputy Office Directors of the Ministry of Education and Shinji Yazaki, the President of the Board of Audit. In this way, as we continued our efforts to establish a foundation, persons who were natural candidates at directors assembled, and actually, in later years, at times when their other responsibilities made it possible, they offered cooperation by becoming directors of the Japan Pair Go Association, and executives of the International Amateur Pair Go Championship. My efforts to do something initially called 'difficult' bore fruit on May 24, 1994: we were certified by the Agency for Cultural Affairs and the Juridical Foundation the Japan Pair Go Association was founded. On this occasion, I put together a pamphlet describing our future vision for Pair Go and exploring the possibilities of its becoming a game enjoyed around the world. Twenty years have passed since then, and I am very happy that Pair Go has indeed developed into a game enjoyed by people around the world as in my original vision. The future plan for Pair Go that Hisao Taki drew up 20 years ago: Pair Go has developed just as he envisaged. What must not be forgotten about the birth of the Juridical Foundation the Japan Pair Go Association is that the Professional Pair Go Championship was started in commemoration. I really wanted to hold a tournament in which 32 of Japan's top professionals in 16 pairs participated, and I requested the president of the Ricoh Corporation, Hiroshi Hamada, whom I met through Mr. Yoshikuni, to provide sponsorship. Mr. Hamada, whose rank was 7-dan, immediately expressed interest: 'Mr. Taki, the idea of all of Japan's top professionals assembling is really interesting. If a tournament in which Hideo Otake and Koichi Kobayashi appear together comes into being, I'll be happy to cooperate.' I visited all the top-flight professionals and talked seriously about my dream of Pair Go perhaps becoming a representative goodwill game of the world. And, under the name of the Ricoh Cup, a tournament in which the 32 top professionals gathered together in one place was held for the first time. 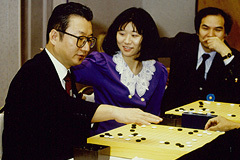 Kaoru Iwamoto undertook the position of the first Chief Referee, saying: 'This tournament will contribute to spreading Go.' Since then, Go Seigen, Shuko Fujisawa, and Hideo Otake, all of whom appreciate the significance of the tournament, have acted as Chief Referee. Top-flight professionals who have participated in the tournament, such as Yoshio Ishida, Koichi Kobayashi, Chikun Cho, Masaki Takemiya, Satoru Kobayashi, and Tomoko Ogawa, have praised the tournament, saying, 'When you actually play in it, it's really interesting.' The Professional Pair Go Championship is ranked among professionals as an important tournament, and this year we have held it for the twentieth time. Thanks to the understanding and support of many persons, Pair Go has grown over the course of 25 years into a game with fans not only in Japan but in 70 countries and territories around the world. What I hope for Pair Go in the future is that we can develop its large potential for strengthening goodwill between nations as a mind sport. In Pair Go, you can enjoy a game on equal terms if you make the sums of the ranks of the players on both sides the same. It is possible to have a highly competitive game between a 9-dan pair made up of a 2-dan and a 7-dan and another 9-dan pair made up of a 4-dan and a 5-dan. This feature of Pair Go makes it a very good tool for deepening friendship between nations. Equality is important for friendship among nations; Pair Go is suited to being a goodwill game because it's easy to arrange for equality between the teams. For example, when enjoying Pair Go at a diplomatic meeting between heads of state, if one head of state is 6-dan and the other is 2-dan, you can pair them respectively with a 2-dan and a 6-dan. The basic feature of Pair Go, that 'when you win you double the pleasure and when you lose you halve the pain', would be a big plus for international friendship. As the originator of Pair Go, it is my strong desire that it contribute to international friendship. Speaking of international friendship, I believe that an accurate worldwide rating system will become even more necessary than now. Besides spreading Pair Go, there is another enterprise that I have taken on. It is the Internet Go-playing server Pandanet, which was created in 1995. When we commenced service, it was widely covered in the New York Times and Japan Economic Newspaper etc. as the only contents used internationally. Perhaps some enthusiastic Go fans remember this. Subsequently, together with the development of the Internet environment, Pandanet underwent a remarkable evolution, with various functions being added, and it has developed into a site that is widely used by Go fans not only in Japan but also around the world. We hope to work to spread Pair Go so that it is also enjoyed on the soil of Africa. We want to develop it into a game of goodwill between nations. It was with these thoughts that Hisao Taki introduced the fascination of Pair Go to the ambassadors from Africa. Our own rating system, which was developed as a part of this evolution and for which we have taken out patents, is much enjoyed by people who want to play games making use of handicaps. Immediately after we made this rating system available, Bunsho Murakami, who was the vice president of Ebara Corporation and who was known as one of the top amateur players in Japan, said: 'Pandanet's ratings are outstanding. Couldn't it be made the world de facto standard?' We were very glad that he evaluated the system so highly. 'One of the important factors that make Go so much fun is the fact that players of different strengths can have equal games by playing with handicaps.' 'The more accurate the rating system on which the handicaps are based is, the more Go fans in general, of course, and also Pair Go fans can enjoy games on equal terms.' 'That's why the rating system is incredibly important. If fair ratings are established, the ultimate enjoyment of Go will be possible.' These comments were passed in an enthusiastic discussion with Mr. Murakami that I remember as if it were yesterday. Our exchange then is still alive in me today as a promise to Mr. Murakami. I want to enhance the precision of the Pandanet rating system more and more and build a structure so that it can be used by the world's Pair Go fans through the Japan Pair Go Association and the World Pair Go Association. This is one of my important tasks for the future and I hope to carry it forward enthusiastically. I hope that by combining forces with all of you we can make Pair Go a game enjoyed and loved more and more by people around the world. To all of you who love Pair Go: let's nourish Pair Go and the future of Go together. ・Founder and Chairman, Gurunavi, Inc.
・Founder and Chairman, NKB Inc.
・President, Gurunavi Research Institute, Inc.